The question of how we understand drawing in our increasingly technological world is fundamental to Motion Capture. While the traditional characteristics of drawing as a tactile and intimate medium might seem at odds with the digital networks of our age, drawing re-emerges in new forms, often in response to technologies that have altered our sense of movement, time and space. Such a technology is cinema, which is an important reference for many of the featured artists. From images by Henri Matisse, through to recent works by Pierre Bismuth that trace the hands of actresses in famous films, relationships with cinema relate to drawing’s own ability to record movement through a sequence of marks. Cinema recurs again in works by Brian Fay, focusing on the dust and scratches that have accumulated in an old Buster Keaton film. As with video pieces by Ailbhe Ní Bhriain, movement in these works is understood in terms of material deterioration and slow erasure of the image. Drawings can capture movement in ways that are both deliberate and involuntary. The psychoanalyst Jacques Lacan used the phrase ‘the rain of the brush’ to describe bodily gestures that escape conscious intentions or linguistic structures. These ideas are developed in works by Susan Morris that use data from a motion capture studio, rendering her own body movements as a series of abstract lines and traces. In Tom Hackney’s work, specific references to chess manoeuvres played by Marcel Duchamp give way to abstraction; real occurrences seem to loose all ‘traces’ of reference. These works, like Henri Michaux’s illustrations that operate between writing and drawing, communication and symbolism, encourage different ways of understanding how artwork can shift between meaning and nonsense, the deliberate and involuntary. The sense of the human body as emerging and unfixed is pronounced in works by William Kentridge and Alice Maher, whose animated films and videos introduce a fluid interaction of human form; Kentridge’s film continues his interest in the body politics of post-apartheid South Africa, while Maher’s work creates a borderless-ness between human and animal, the familiar and uncanny. The sense of connection between drawing and the human body is perhaps most demonstrably expressed in Dennis Oppenheim’s Two Stage Transfer Drawing, which presents a video of the artist and his son copying drawings on each other’s bodies. Movement here is not only in the tracing of the drawn line, but in the generational movement of father to son and vice versa. A different sense of proximity occurs in 16mm film works by Tacita Dean and Duncan Campbell. In Still Life, Dean’s camera focuses on the markings on working surfaces in Giorgio Morandi’s studio, while Campbell’s work pays playful homage to German artist Sigmar Polke. These works not only represent the work of younger artists approaching the legacies of others, but they refer to elements of drawing as a counterpoint to the mechanical movement of the projected film. The relationships between drawing and moving image explore ideas of technology, legibility, and the human body, both in the act of drawing and the act of looking. In this way, Motion Capture seeks to re-think the relationships of artistic media, and to re-invigorate the relationships between artwork and viewer. A comprehensive exhibition catalogue will be released in Autumn 2012. For further information and advance orders, please email exhibitions [at] glucksman.org. Lines of Thought, a symposium on drawing will take place at the Lewis Glucksman Gallery on 18 October 2012 and will include guest speakers Pierre Bismuth, Brian Fay, Susan Morris, Ailbhe Ní Bhriain, Lucy Dawe Lane and Katherine Stout. Booking essential. For further information, please email info [at] glucksman.org. 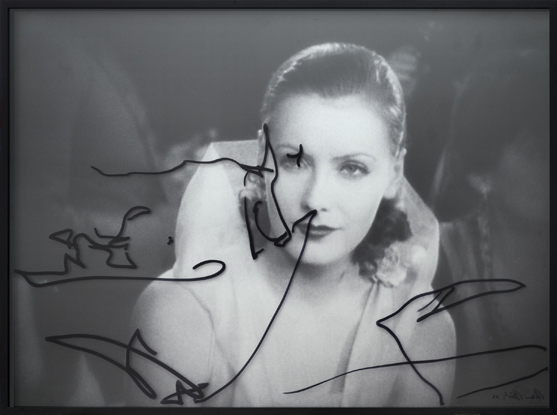 Image: Pierre Bismuth, “Following the right hand of Greta Garbo in ‘Flesh and the Devil’,” 2008. Permanent marker on anti-UV plexiglass and lambda print on forex. 114 x 153cm. Courtesy of Bugada & Cargnel, Paris.